TORONTO -- Demand for newly legal pot appears to be outstripping supply as retailers run low on some products or are cleaned out completely amid a shortfall that could last for months. Manitoba Liquor & Lotteries said Thursday that it is expecting product shortages in both brick-and-mortar and online stores could last "up to at least six months." "Every province -- not just Manitoba -- is receiving substantially less cannabis than originally requested... Retailers in Manitoba will be receiving staggered shipments over the next few weeks (some daily) in an effort to meet their requests," said a spokeswoman for the Manitoba crown corporation in an email. A B.C. 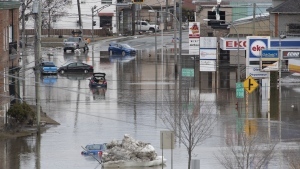 Liquor Distribution Branch spokeswoman said that "shortages are/were expected to impact all jurisdictions across Canada as some (licensed producers) look to opportunities in overseas markets." Four of the largest licensed producers indicated to B.C. earlier this month they would not ship their full product commitment in time for the launch of online sales and the province's lone store, she added. "LPs point to a number of factors in reduced product volume and assortment including issues with supply chain, lower than expected crop yields, and insufficient supply of packaging materials," the spokeswoman said in an email. 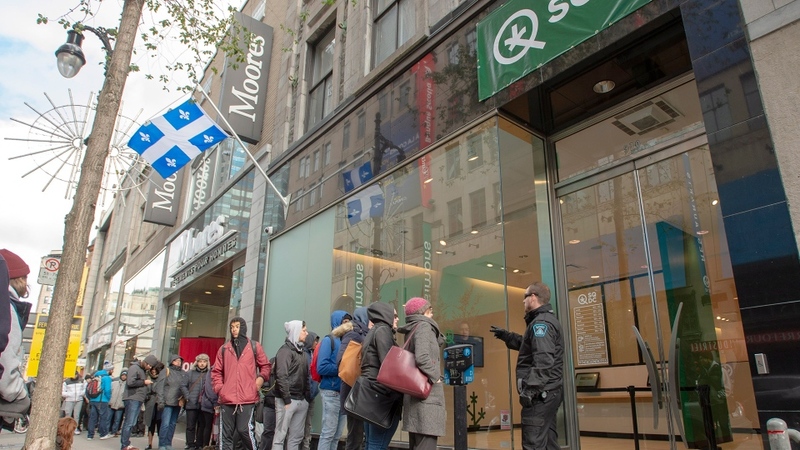 On the first day of legalization in Canada, Quebec's crown cannabis corporation had recorded more than 12,500 in-store transactions and 30,000 online orders, which "far exceeds" its expectations. In Alberta, where private retailers handle in-store sales, the government-run website processed 8,300 orders as of 3:30 p.m. local time on Wednesday, worth approximately $730,000, a spokeswoman for the province's gaming, liquor and cannabis commission. The online-only Ontario Cannabis Store would not release specific numbers, but spokesman Daffyd Roderick said "the response to cannabis legalization has resulted in a high volume of orders." Online delivery will now take as long as five days, as opposed to the earlier timeline of one to three days, due to the volume of orders in the first 24 hours, he added. Ontario Premier Doug Ford had said on Wednesday morning that OCS.ca had handled 38,000 orders since its midnight launch. "The first day of recreational sales in Canada appears to have been a success highlighted by the long lines and enthusiasm from shoppers," said GMP Securities analyst Martin Landry, after his research team visited retail stores in four different provinces to take the pulse of shoppers. "Seeing cannabis shoppers wait in lines as opposed to take the traditional easy illegal supply route is refreshing and bodes well for the recreational market in Canada," he said. The Quebec Cannabis Corp. said Thursday that some items are unavailable on its website and it expects further product shortages -- particularly oil, capsules, atomizers and pre-rolled joints -- going forward. "Given the craze created by the legalization of cannabis and the scarcity of products across Canada, the (corporation) expects significant short-term supply challenges," it said in a statement on Thursday. Private retailer Thomas Clarke in Newfoundland and Labrador said he is continuing to turn away customers at his store in Portugal Cove-St. Philip's after completely selling out of product Wednesday. Chief executive of retailer Fire and Flower, Trevor Fencott, said its five stores in Alberta and Saskatchewan are fully stocked but it won't launch its online store for Saskatchewan until it receives more supply. Consumers going to British Columbia's website on Wednesday were told that several strains of marijuana were sold out and B.C. 's only retail location in Kamloops ran out of one variety of dried cannabis. The province's Public Safety Minister Mike Farnworth said Thursday he wasn't concerned the province would run out of legal marijuana in the first days of legalization. "This is an agriculture product, so we'll get some varieties coming in soon and others may take a little while to put in place," he said. "As we know the federal government has put in place additional licences, for example, and the product from those is coming on stream." "There is mega demand... This is the end of prohibition in a fashion that is absolutely, globally unequalled," Linton said.